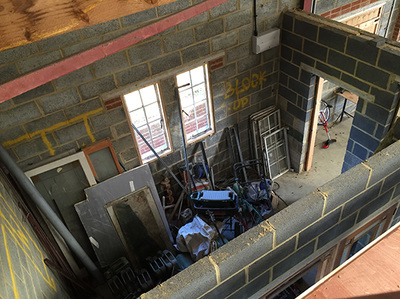 We thought we would keep a diary to see how the project progresses. This is not a 'journal' diary but more of a list of actions and responses. It is a way of finding out the quick elements of the build and the slow elements that hold up or stall the project. The project milestones are in green. 22nd April 2014 - Plans requested from Jim Kiger of ReplicaPlans in the USA. You have to send him cash in dollars from the UK. 23rd April - Spoke with Jack Kearby of Tulsa, Oklahoma about Sopwith parts. Automated response from Maxine Oades of LAA. 10th May - Met with Jack Kearby at Stowe Maries. Jack passed on contacts to get certain parts built out in Texas. 22nd May. Wrote to Paul Ford, an old contact that has built a Fokker DR1 for some advice and steer locally on building and parts. 23rd May. Flew to Pent Farm to chat to Howard about LAA inspectors they have access to and facilities available if needed. Amazing set of drawings from Jim Kiger. Found 8 switches, a cockpit watch and a sight gauge. Amazing set up where they build Spitfires, look after Harvards, Tiger Moths, Cubs, Yaks and many more unbelievable aircraft. Really friendly bunch of guys and very helpful. June has been spent researching power plants. After seeing the Shuttleworth Collection's Sopwith Triplane go nose up (video below - Thankfully the pilot was OK) due to the way you 'Blip' a 130hp Le Clerget 9B and the sink rate, the Sopwith triplane hit a metal gate post - the video shows it al! We really want our triplanes to be reliable and useable on a regular basis so we are exploring options and moving our attentions to a more modern and reliable radial. 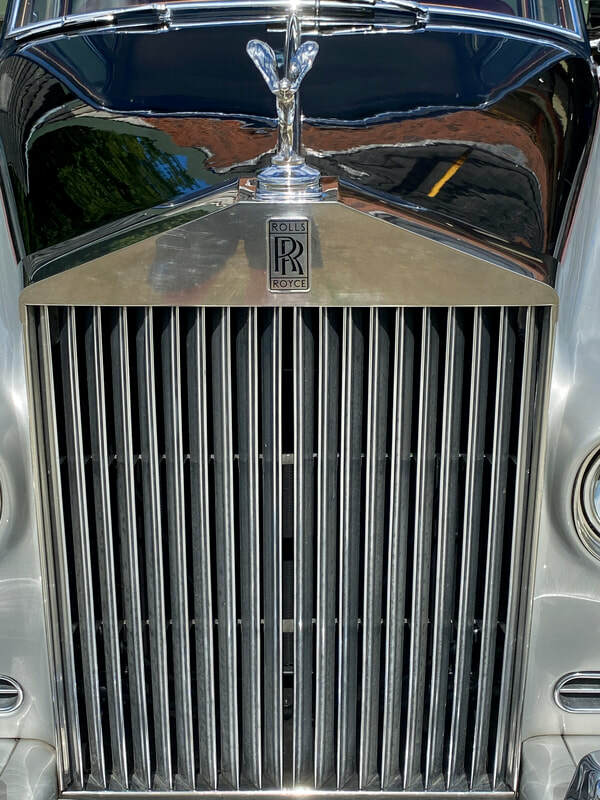 Emails have been sent to gather information on the Rotec range of radial engines. We have seen the Rotec 2600 use in replica aircraft in the UK at the LAA rally at Sywell. 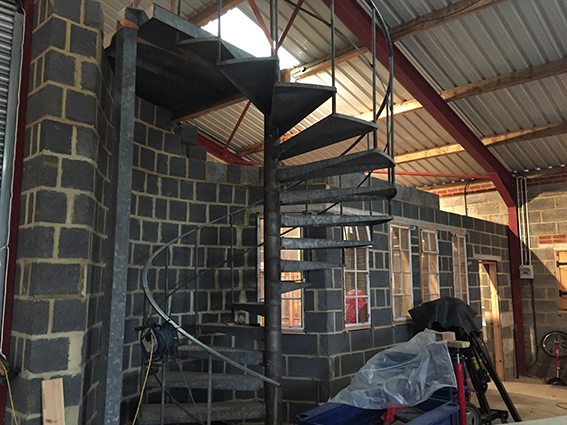 We continue to work on the workshop and managed to procure a staircase for the mezzanine level. More work on the workshop and a lot of work finding source information. We managed to get a copy of the Sopwith Triplane Technical Handbook from the National Archives. You can download a copy by clicking the link below. August saw the Light Aircraft Rally (LAA) take place. We got talking to the LAA admin staff and they were surprised to learn our registration pack had not arrived. They said they would chase it up. We met some amazing people at the rally and it really helped to get some first hand advice. Got a note from the LAA from Fiona Stoner with regards to our registration pack as follows "Dear Paul, We are sorry that you have had to chase us for a project registration pack and for the delay in getting back to you. Your enquiry is currently with Francis Donaldson, Chief Engineer, as he needs to write a letter to accompany the project registration pack. I reminded him yesterday that you are still awaiting the pack and it will be sent to you shortly." So hopefully the pack should be with us soon. In the meantime, we continue to collate materials for the workshop. This has been a really slow month due to work and a change in the weather. Some time was spent on the workshop but most efforts have been put in to finding out information about building a Sopwith Triplane. Again, we collate information and find sources. There has been no work on the workshop this month. 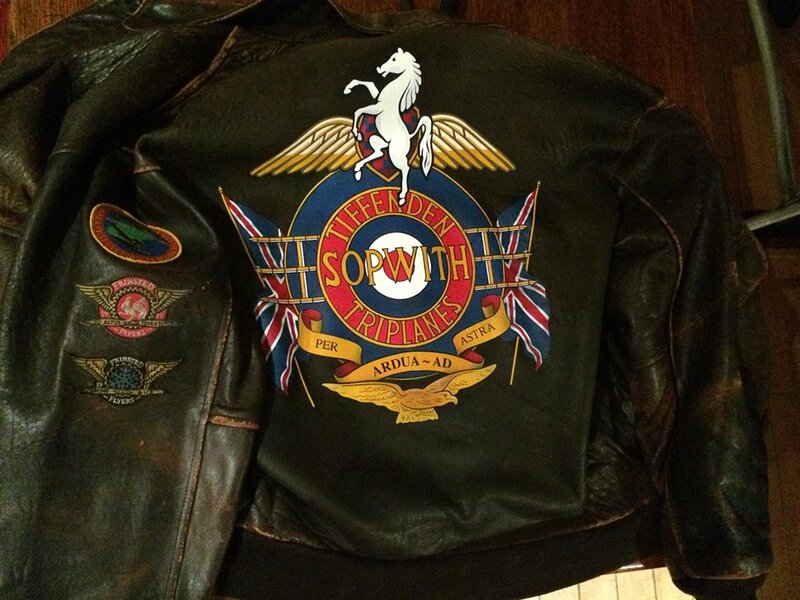 Our flying jacket returned from Jo at AEROGRAFFITI and we found some interesting Royal Naval Air Service memorabilia. This year was spent trying to get the workshop together. It has proved to be a slow process but we are getting there. Finally there is light at the end of the tunnel. We have called the Light Aircraft Association to see how they are getting on with our registration pack. We are still waiting. We spoke to them at the LAA rally too and they said they would chase it up? Fingers crossed we get some positive news in 2016! LAA have been in touch and requested more information. Hopefully this will lead to our Registration Pack! 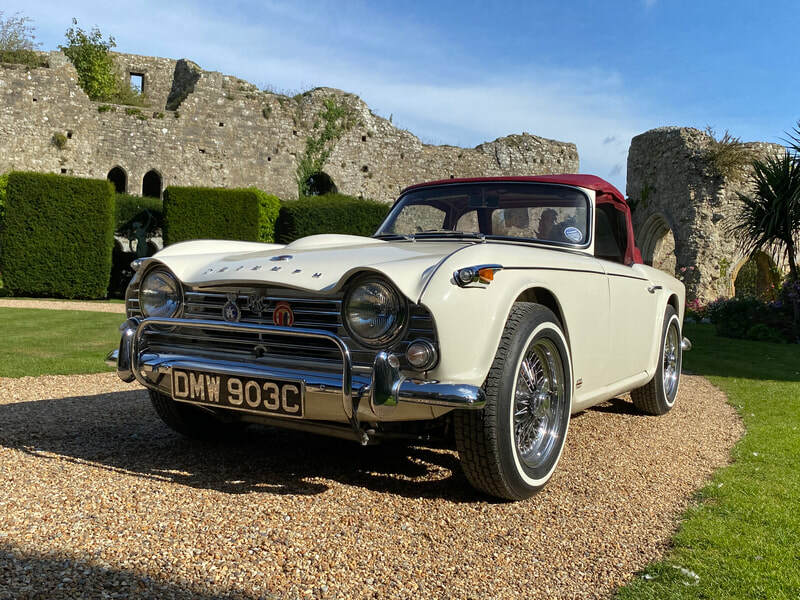 Workshop building has stopped due to getting a classic car restoration finished. Work will resume in April. 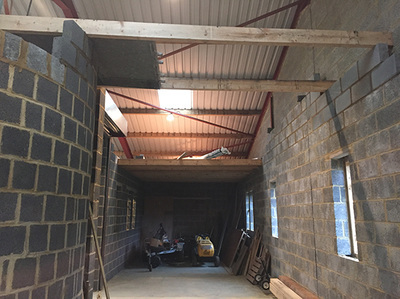 We have insulated the workshop so that it will retain heat and be a pleasant environment to work in. 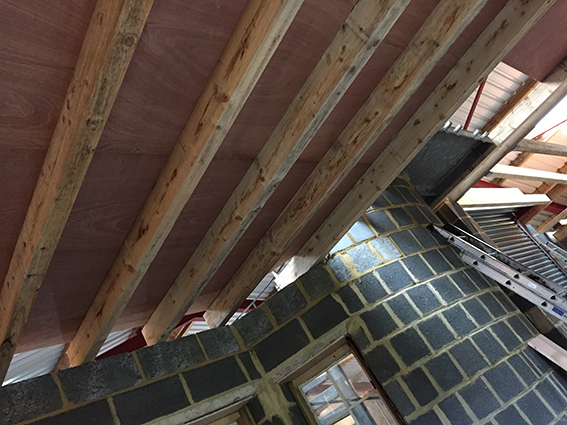 Removing any damp air also helps when working with wood. The insulating has taken time as we are building double skin walls. 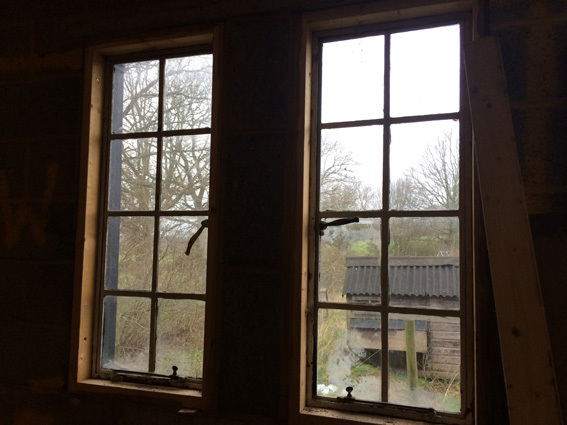 We wanted a WW1 feel to the workshop and found a chap selling a whole houses worth of WW1 Critall windows on eBay. He was replacing them with Modern UPVC. We told him about our project and he gave us an amazing price for the lot!! The chap in question was the space scientist Tony McDonnell who worked on the Rosetta project as well as studying Moon Rocks for NASA and having an asteroid named after him. 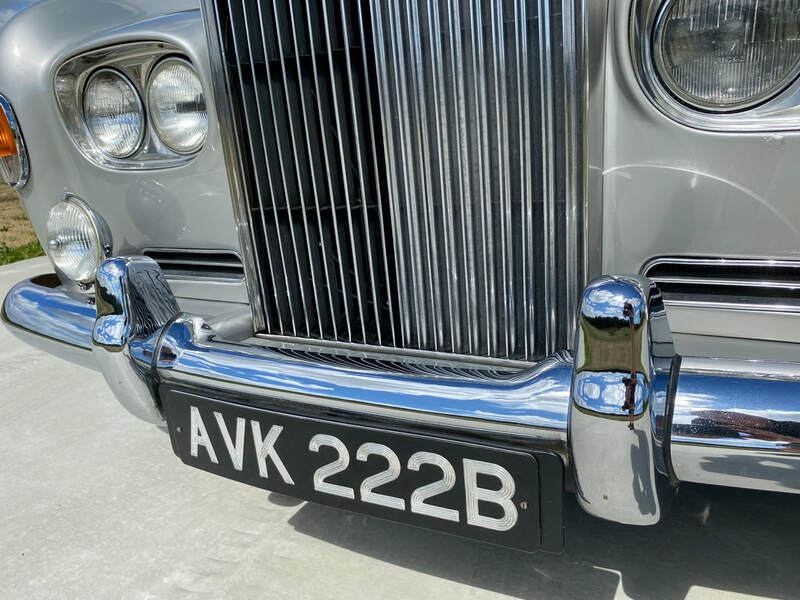 He is also a classic car fan with a 1920's Wolseley tucked away in his garage. We have a lot in common! Thanks for the Windows Tony. 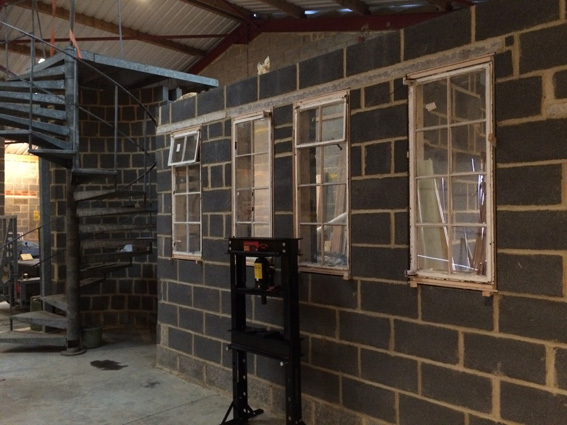 Pictures below show the windows in our workshop. Wen just have to render and paint the walls and we are done - pretty much. Picture on the right is our sketch/plan of how we want the workshop to workout. Everything has been designed with the dimensions of WW1 aircraft and working room in mind. We hope to put solar on the roof to keep us warm in winter. Just a thought right now but we will investigate it. 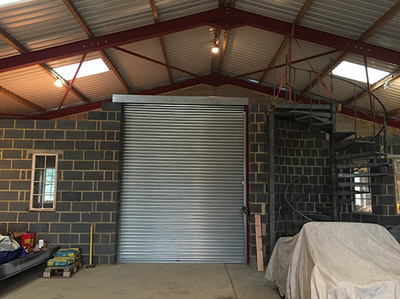 Pictures on the left show the workshop progress as at 20/07/2016. 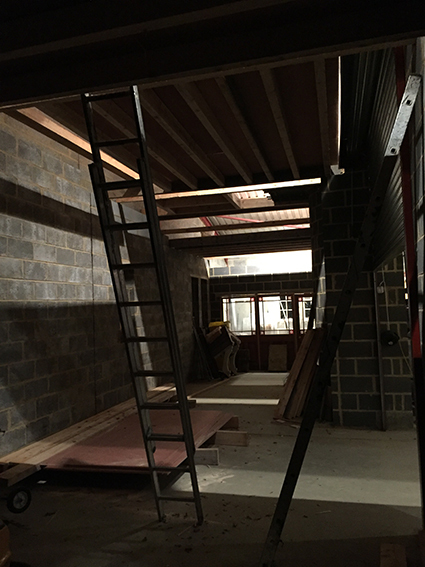 We have put the ceiling section in which doubles up as overhead storage for us. The walls have been insulated so we have a warm workshop in winter and a better environment for storing wood, glues, resins. After an email in February 2016 we have not heard anything else from the LAA. We have emailed again to ask of progress for project registration. At today's date we have been waiting 2 years 3 months for a registration pack. 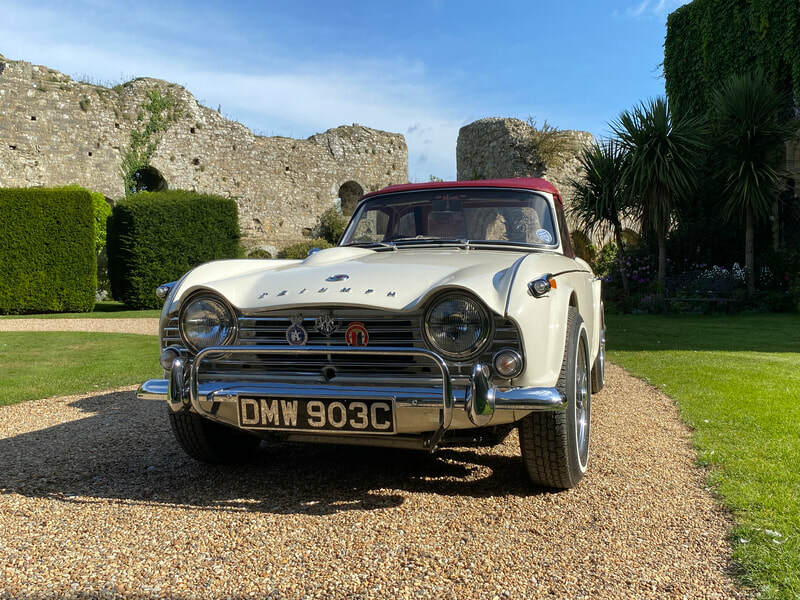 Good news is that more people have offered to help and get involved in the project. 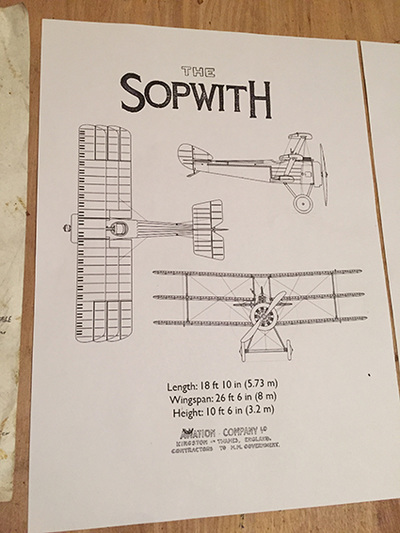 We now have 3D CAD designers X 2, Vintage aviation woodwork specialists, several pilots and a group of other people from mechanics to saddlers all wanting to be part of it and build Sopwith Triplanes. 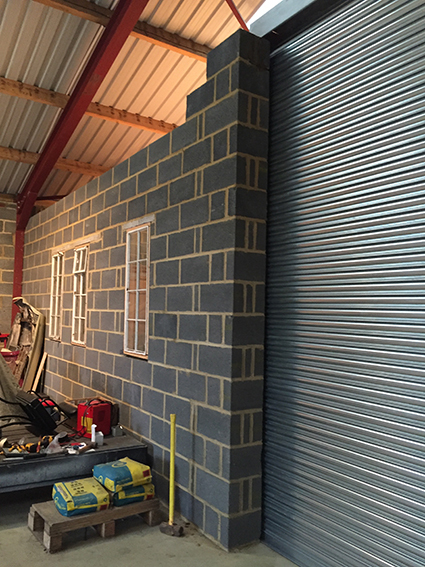 Work shop is coming on great. 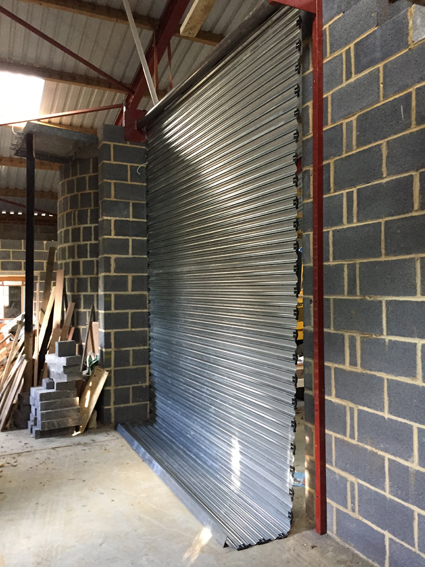 We managed to install the roller shutter door today. Just needs finishing on the door edges and runners and that is another bit moment in the build confined to history:-) Emailed the LAA again! No reply! September 12th 2016 - We have heard from the LAA - All is well. I was working in the vicinity (40 miles away) from the Light Aircraft Association HQ and took the opportunity to drop in and see if I could get our Sopwith Triplane Project registered. I bumped in to Steve Slater the CEO and spent some time chatting and he gave me a few contacts to get going on the project. 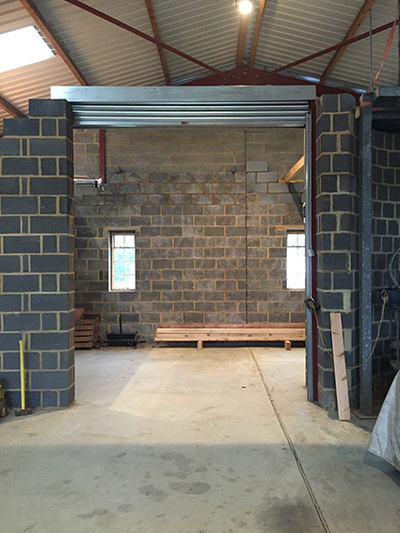 Amazingly we now have a build number and project is good to go. Our build number is LAA 366 - 15426. This is a real milestone in the project and now the hard work starts. 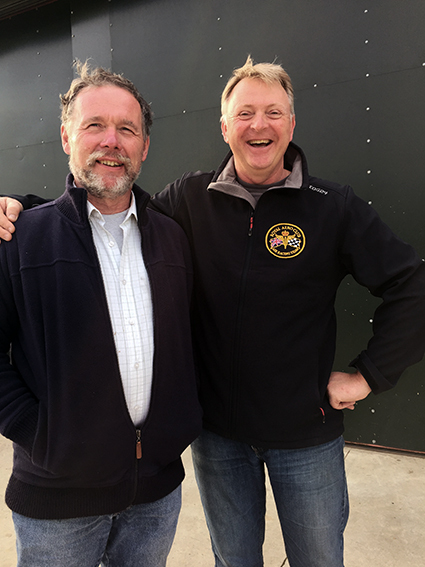 Picture shows Steve Slater CEO Light Aircraft Association with Paul Anderson. So, thank you to Steve and Fiona who were most helpful on the day and I am really glad I dropped in. The biggest task now is to sort out who our LAA inspector will be - we do have a good idea but not confirmed. At this moment in time, we are jumping up and down with excitement but we are under no illusion the task ahead is enormous and a huge learning curve awaits. So, we'll finish up the workshop, get our inspector appointed, start to find parts, get techniques and skills sorted and hopefully at the end of all this there will be a Sopwith Triplane (or 3 :-) in the skies above Britain! I thought the guys at Pent Farm could be my LAA inspector but this is not the case. They put me in touch with Barry Webb who has agreed to meet up in a couple of weeks to talk over the Sopwith Triplane build project. 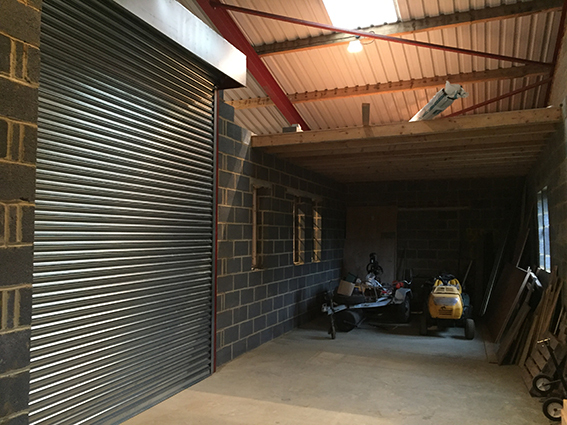 We had put up the roller shutter door in the workshop but it did not work. So we dismantled it and set about finding the problem. In a nutshell, there were numerous issues. The brake has seized. The rivets and sheared on the motor drum. The switch wiring was causing trips. We worked through the problems and I am pleased to report that our roller shutter door is fully operational. We managed to do some more blockwork and get the supporting timbers for the mezzanine in place around the spiral staircase. 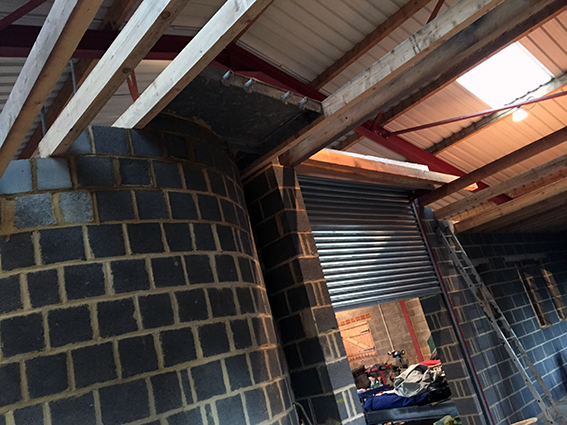 We have insulated the clockwork to keep the workshop warm in winter. Next steps are to secure the staircase and get the flooring in on the mezzanine. 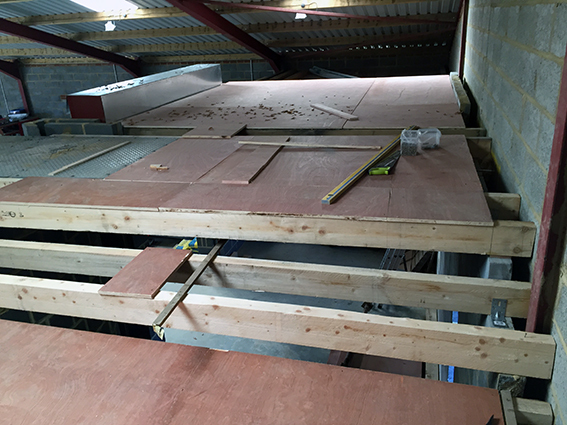 The centre section of our workshop is taller than the 2 sides of our workshop to take the height of the cabana struts. The finished height of a Sopwith triplane is 10 ft 6 in (3.2 m). So we have got around 3.5m clearance. The mezzanine stairs are now locked in to the wooden cross beams. 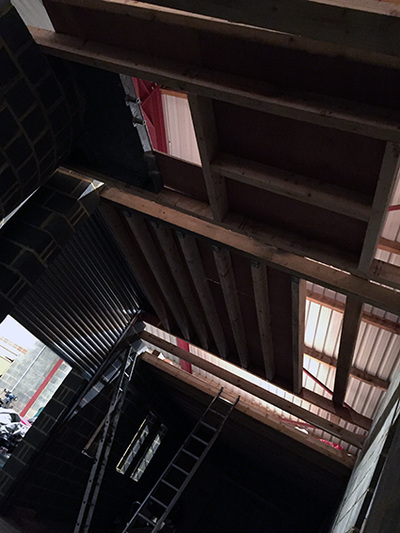 Workshop mezzanine ceiling continues to grow. Hopefully be the end of this week we should have finished this part of the workshop build. Great to see it moving on. 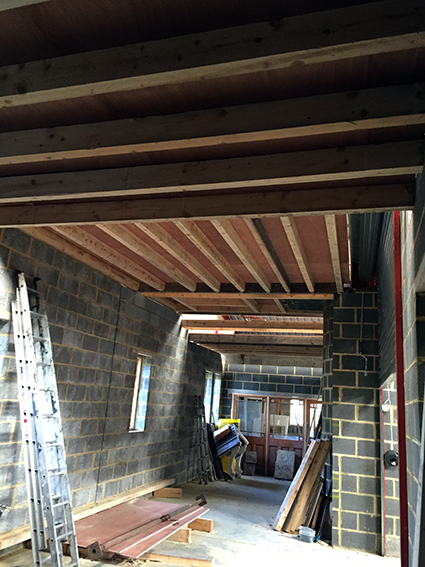 The centre section of the mezzanine ceiling is to take the height of the cabane struts of the Sopwith Triplane. We had to do a double check on the height as a Triplane is 3.2m high with the wings fitted. We think there is about 7cm to play with due to the dihedral. 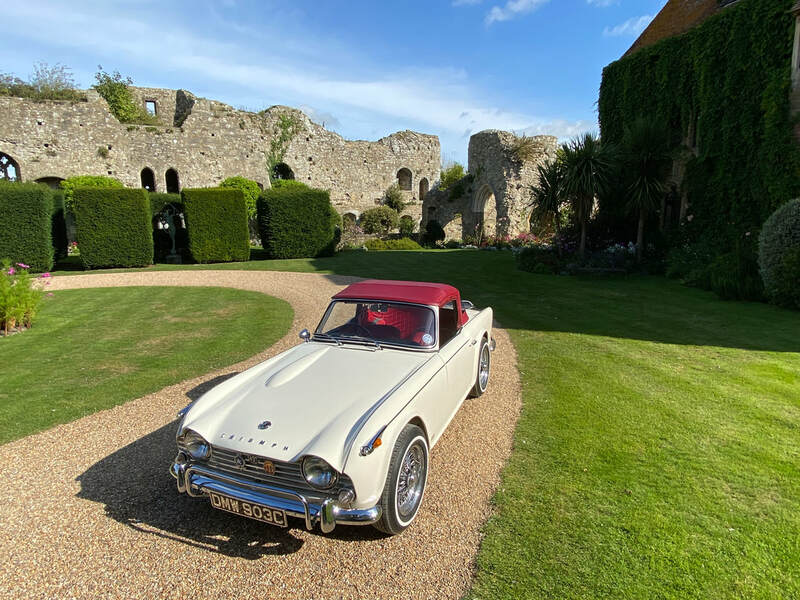 Our ceiling height is 3.4m so fingers crossed we have this right? Spent a great afternoon with Barry Webb who will potentially be our LAA inspector for our Triplane project. Picture on the right shows Paul Anderson with Barry Webb at Tiffenden Triplanes. Barry is an absolute mine of information on almost everything:-) He has every confidence our workshop will be great when finished and he stressed the timescales unbuilding a project like a Triplane. Wise words. We'll be keeping in touch over the next few weeks to see how it all pans out and to discover next stages. 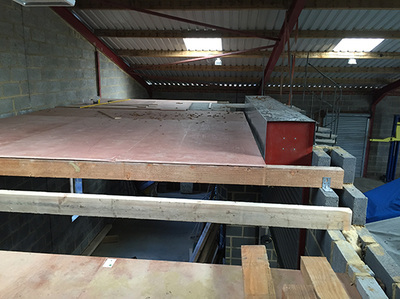 The workshop progresses with the floor on the mezzanine finally in. 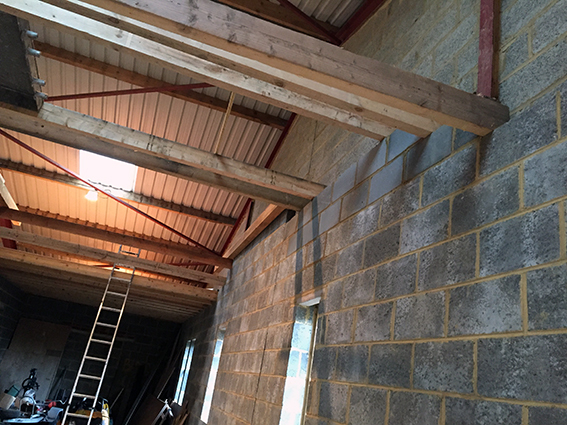 Just a few bits of finishing and we will be ready for first fix electrics for lights. 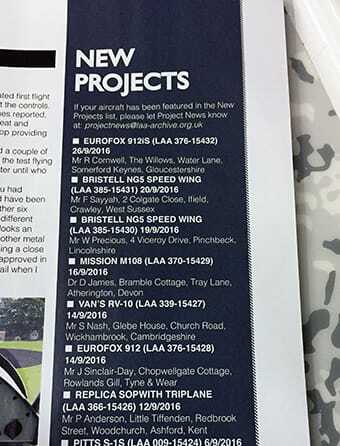 Our build registration and a little bit about 'Tiffenden Airfield' Appears in the LAA Kent Strut magazine. We also feature in the 'New Projects section of the LAA magazine below. 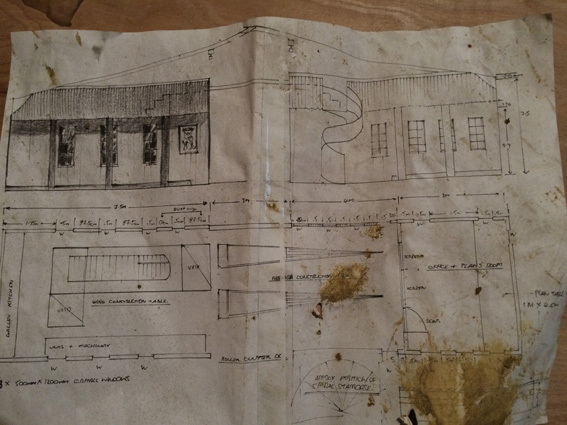 Have source some tin sheeting that is needed for the workshop from a friends barn restoration. 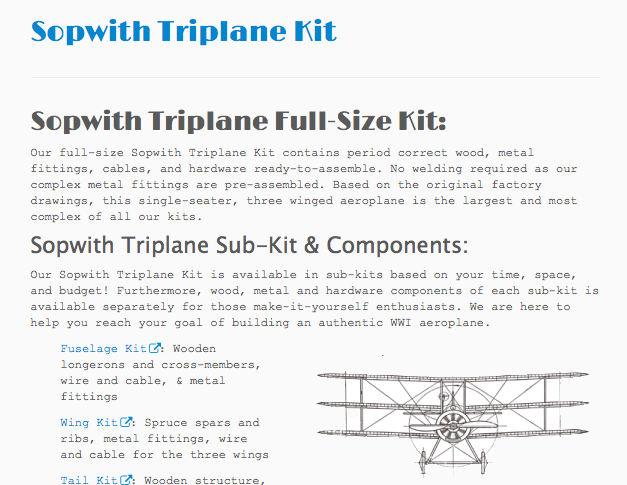 ​Have discovered Kip-Aero who make a Sopwith Triplane full kit. 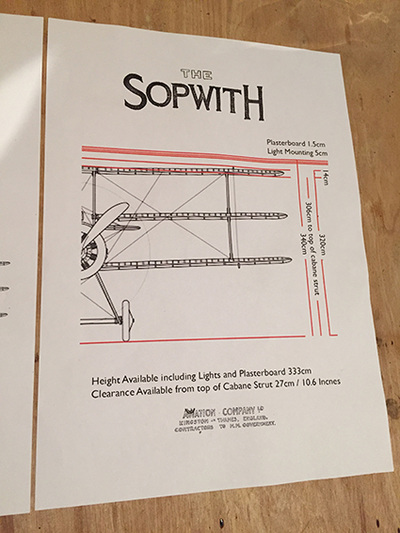 You can visit them here: ​http://www.kipaero.com/sopwith-aeroplane-kits/sopwith-triplane-kitwww.kipaero.com/sopwith-aeroplane-kits/sopwith-triplane-kit//. This requires more investigation but looks really cool. The whole kit for a Triplane for around $120,000. Chad Willie has made a metal fuselage for theSopwith Triplane. You can see it here: http://stcroix.50webs.com/pages/sopwith.html It was this fuselage that The Vintage Aviator Ltd in New Zealand used to build their Sopwith Triplane. It reduces the build time by quite a bit. More engine choices pop up with the Warner Scarab and the The MT-14P 220HP so looking in to both to see the viability. Have been given a better resolution version of the Sopwith Triplane Technical Notes by Mike Ayling - Thank you Mike. See them HERE.